The One Day of the Year is an interesting play. The subject matter about Anzac Day is provocative and challenges long-held assumptions about nationhood but interestingly it is the reception of the play that singles it out. From its aborted opening to its latest incarnation, this is a play that has divided groups. But its reception academically is even more telling: rather than being studied as a play, it is being used as a historical artefact by leading historians for whom the play represents an important social history. This resource will focus on the literary aspects but the historical facet is a primary concern, so any class undertaking a study of the play needs to explore the context in depth. Thematically the play is about coming of age rather than just Anzac Day. Alongside Anzac Day – the nation’s coming-of-age myth – we have a young man who is also growing up. Like the nation, he needs to cast off the old and move into a new way of thinking. The play might be dated but approaching the text with this understanding may lead into an effective recontextualisation of ideas of nationhood and the individual in Australia. Why is context so important in understanding the play? How does Alan Seymour exploit the dramatic form to support the ideas in his play? What can we learn about Australian society from a close study of The One Day of the Year? Why is The One Day of the Year such a significant play? Focus question: Why is context so important in understanding the play? How do we celebrate Anzac Day? Share your experiences of Anzac Day. Share moments when your parents just didn’t understand you. Which events in your life are about coming of age? Which events in Australia’s history are about coming of age? unity of action, conflict/complication, climax, exposition, resolution, denouement, act, scene, stage directions, proxemics, apron stage, action, protagonist, antagonist, audience, blocking, episodic structure, set, props. On this one day of the year. What was the attitude of contemporaries towards Anzac Day? How has Alan Seymour’s appropriation of the poetry line altered the original sentiment? No text is written in a vacuum and reflects its times: sometimes confirming, sometimes challenging established values. There are a few contexts to consider: the context in the play, the context of the author at the time of writing and the context of the audience (at the time of the play up to the present). The late 1950s was a time of rejection of traditional values. It was a time of rebuilding after the Second World War when Australia was booming and education was becoming widespread. This new-found wealth and education in Australia had consequences as it was a challenge to established ways of life and this is very much what we see in the conflict of Hughie and his father, Alf. We see gendered difference also being challenged through Jan and Mum, with domesticity no longer the norm, and a new term, the ‘generation gap’, being used to reflect the different kinds of aspirations and values of the new generation. We also see the rise of a wealthy class divided in different suburbs; divisions enter Australian society, which prided itself on being egalitarian. The playwright Alan Seymour writes in his Author’s Note (in all editions), ‘A play should be studied in its social, theatrical and even geographical context of its time.’ From there he proceeds to focus on the theatrical traditions, but ask students to think about social and geographical context. What is the social context? What is the geographical context? Why is each element important in this play? In order to understand the significance of the text students need to explore all the contexts (text/author/audience), and think about their own society and the values they have as 21st-century citizens. They can complete this table summarising the different contexts (social, historical, political, personal). The author’s context information can be found in the Author’s Note at the beginning of the play and can include further internet research on the late 1950s. The context of the text can be determined by reading the play and finding out what was happening at the time in the play. The audience context can refer to different audiences but in this case students should consider their context as 21st-century Australians and their attitudes. An important background reference for students and another context is Anzac Day itself and the original landing at Gallipoli. The first report on Gallipoli is by Charles E.W. Bean, the official war reporter, and was tabled by the Prime Minister’s Department on 17 May 1915. What aspects of heroism does Bean capture in his report? Students should consider the words applied to the Australian soldiers and whether they have negative or positive connotations. As they read the play, they can collect all the references to the event in the play with an indication of who said each, and then compare the references to that of Bean. Who in the play most closely concurs with Bean and who disagrees? What aspects of the Anzac story is there conflict about? Consider especially Wacka’s description of the event in Act 2 Scene 3. Why is his view so important? Focus question: How does Alan Seymour exploit the dramatic form to support the ideas in his play? Any study of a play has to deal with the way the different elements come together to create meaning. The play’s elements include setting, character, plot, construction and language, which all work together to reinforce the ideas or thematic concerns of the play. These elements can be dealt with at a superficial level or with more complexity. The movement from superficial to complex ideas is mapped out in the discussion of each element below. The setting is Australia, 1958, so the play is centred in a domestic scene; it is a working class home and an interior setting. Once students determine what setting is, they need to consider how elements of setting support the themes. Each of these elements implies a bigger message. Activity: What expectations of themes are set up for each of these aspects of the setting? Australian – will this be a play commenting on Australia as a nation? Working class – there is a class structure being alluded to in a society that claims to be egalitarian. Jan Castle comes from a very different setting that is mentioned but never shown, indicating that Hughie’s family is excluded from wealth. Interior – this is a play about ideas and relationships, and not action. The interior setting reflects that it is inside the mind. Read the opening setting notes. Draw the set using the description offered. List any positive and negative words in the setting description. Connotations are important – for example, saying it is on the ‘Western side of the city’ is critical as the Western suburbs tend to be less advantaged economically. Note, however, the context is different to now: the placement in the inner city used to imply poverty but now people are moving back to the city and the suburbs are becoming gentrified. Setting and objects (like mise en scène in films) tell us about the characters and what they value. In this text Seymour has used an interesting opposition of the words ‘primitive’ and ‘modern’. The kitchen is a ‘primitive home made kitchenette’ but Hughie has a ‘modern camera’. What does this opposition suggest about Hughie’s relationship with his family? Does he fit in? Creative writing: use your own home and write a description of your room and lounge room for a play. Remember that you don’t need to describe everything, but locate a couple of things that show who you are and what you use the room for. Give this description to a friend to draw as a stage set and see if it is close to what you were describing. Now look at setting in the dialogue. What words does Jan use to describe the setting she sees before her? How does Hughie respond to her comments on the family home? What type of people can we see emerging when we look at these comments on setting? The best ideas come from seeing one character contrasted with or acting as a foil to another. The ensuing conflict drives the story and also offers us ways of judging characters as right or wrong. We don’t need to be explicitly told about the personality of a character – that emerges implicitly from the things said or done, and from interactions with other characters. In a play about national identity such as this play, it would be acceptable to expect a war hero but Seymour avoids traditional heroism. The closest character to a hero is Wacka, who has come out of the war with no family or future, in itself a condemnation of war. Heroism becomes part of the everyday man’s existence. Seymour is also able to develop the characterisation through giving each character their own voice. Hughie’s education is reflected in his use of terms such as ‘proletariat’ and ‘theory’; Jan’s snobbery is revealed in her overuse of words such as ‘gorgeous’ and ‘tiny’ used sarcastically; Wacka’s silence means that when he speaks what he says becomes important but it also positions him as an ‘Aussie Battler’ who accepts the odds and doesn’t complain. Despite his silence he is the central character to the play and the audience sympathises with him because of the strength of character that is implicit in his silent acceptance. The following grid is based on the Facebook profile page about you. Try to fill this in for the characters. Why can’t you fill in all the details? How has society changed? Do the characters’ names have any significance? Students can be divided into groups and given responsibility for one character each. They are to fill in the chart using the play to locate examples and then share their findings with the class. How is the character described in the stage directions? What does the character talk about? How does the character talk? (Look for stage directions e.g. angry.) What does the character do on stage? How do the other characters relate to the character? How does the character fit into their setting? What conclusions can we draw about the type of person this character is? What beliefs and attitudes does this character have? Is the author justified in this self-criticism? What does drawing a character mean and how can we assess this skill? How can we determine the difference between stereotype and well-drawn characters? Look closely at the way the characters are drawn to come to an understanding of Seymour’s comment. One way of defining good characterisation is to look for development. Good characters develop into better people in a play. Consider the characters against this definition. Who is willing to change? Who actively seeks change? Who rejects change? Construct a table and list all the characters. Write down if they change or want to change and give examples of this change. Now reconsider: is Jan convincing? The following statements about characters require evidence. (The first three come fromThe Age article.) Students should work individually to decide if they agree or disagree with the statements. As a class they can then indicate agreement or not and argue to defend their attitude. This requires evidence to prove the point. Follow-up: Students might want to go to The Age article from which the first three statements originated to see what evidence is given by the writer. This could elicit further discussion. Aristotle’s The Poetics (around 350 BC) is still the basis for understanding the structure of plays. Aristotle believed that the play’s action was like a triangle, starting low and building up to a climax which is then unravelled – an introduction, middle and ending. In the 19th century this structure was refined by Freytag who felt that it was a five-part development. Students can find more detail at an online resource about Freytag’s Pyramid. The play displays features of traditional unity of plot as it is structured around Anzac Day with the march central in Act 2, the lead-up in Act 1, and the consequences in Act 3. Activity: graphing the plot – Students should locate different graphs of plot structures for plays. As they read, they map out the play on a graph such as Freytag’s, showing what event in the play matches each stage. This play is a time capsule of Australian language. It is therefore interesting to see how much the Australian vernacular has changed. The different language creating an individual voice for different characters (see Character section). ‘Each country has its own habits of speech . . . [S]electivity and absolute accuracy to the emotional truth behind the speech can produce something quintessential which reveals far more than the way a nation speaks: it somehow catches, isolates, illumines the way its people think and feel.’ In order to see how this emotional truth reveals the national identity we can focus on the opening lines. I’m a bloody Australian and I’ll always stand up for Australia The first lines of the play are an assertion of being Australian and acting as an Australian. There’s an unquestioning acceptance signalled in the nationalism of this statement. bloody Pommy, you can’t say anything to ‘em they still think they own the bloody earth. The place is full of ‘em. The British are regarded as the imperial master. A consciousness of colonial subservience emerges in the comment of owning the earth. Being Australian is as much about who you are not. How is this dialogue an example of an emotional truth? Alf comes from a generation that feels disenfranchised but also strongly nationalistic. The 60s was a time where the colonial past was still in the national consciousness as a rivalry. We see the strong emotions about the past, and the sense of isolation even in these two lines, through Alf’s assertions of identity. This need for assertion implies a nation coming to grips with who it is but also a need for unity. Added to criticism of the British are the Italians and all the other migrants of the post-war period. This is clearly a time of change and the heightened language of Alf indicates how negatively this change was viewed by Australians. But it also shows the narrow-minded perspective of the old Australia represented by Alf. Find words that are no longer used (obsolete) and add them to a vocabulary list with explanations. Work in pairs to complete a close reading. Students can be assigned a section of text to analyse. They can use the format of the table above with lines, interpreting lines, and then analysis. This has to be presented to the class. Despite the public outcry about the play’s attitude to Anzac Day, this play goes beyond the one day of the year. 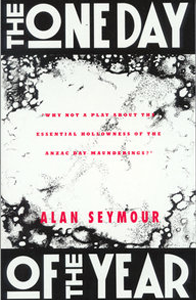 What Seymour foregrounds in this play, through the language and attitude of Alf (see language section), and the generational conflict between Alf and Hughie, is an Australia in crisis, casting off colonialism, facing rapid growth through immigration and experiencing changing social dynamics through the increasing wealth of the country. Anzac Day, which is central to the nation’s understanding of itself and its identity, comes under attack but the play is bigger than just Anzac Day and deals with Australian identity in general. The son Hughie is the new Australia who, with access to education, can change himself. In order to do this he attacks the most important belief his father holds: that of Anzac Day. Students can trace the attitudes to Anzac Day on this grid as they read the play. What he/she says or does about Anzac day What attitude or value does this show? Develop a thesis statement about how the play explores Anzac Day and the play. Develop a thesis statement about how the play explores the generation gap. Focus question: How does Alan Seymour exploit the dramatic form to create his play? Remind students that any literary essay should refer to the features of the form as evidence. Elements of plot, character, setting and the language used all come together to create meaning. The following statements can help develop a thesis for an essay. Students can work in groups to choose one statement – they should then collect evidence for that statement considering setting, characters, plot and language. They can collate these notes into a diagram using a program such as Inspiration to show the relationship between ideas. Once students have created it, the diagram can be used as the basis of an essay – with evidence supporting topic sentences which support the thesis. Do you agree with this statement? Write an essay responding to this statement. In your response refer to the setting, characters, plot, language and themes. Do you agree? Write an essay responding to this statement. In your response refer to the setting, characters, plot, language and themes. Focus question: What can we learn about Australian society from a close study of The One Day of the Year? This play’s significance is national rather than worldwide and yet it isn’t parochial. It reflects the growing unease of the late 1950s, which became the generation gap of the 1960s and then the anti-institutional revolutions of the 1970s, which happened all over the Western world in the post-war period. The One Day of the Year is a slice of Australian social history. It captures the people and the thinking of the time about many social issues including immigration, poverty, education, social class and wealth. By tracing the issues across different times we see that Seymour was capturing an important moment in Australia’s history. The impact of the play is confirmed in the way it is regularly cited by social historians and by journalists writing on Anzac Day. The immediate stimulus for his writing is clear in Seymour’s Author’s Note to the play when on the ‘most solemn day’ he found a ‘beery haze’ that amplified the ‘heady sentimentality of that day’. But we need to explore the context further to consider that the play is also part of a time of economic growth in Australia, which led to generational conflict as more possibilities opened for young people who started to feel general disenchantment with traditional values. The One Day of the Year is frequently cited in discussions about the changing Australian society. The following extracts from the play can be found in recent texts that don’t explore the play in any detail but use The One Day of the Year to make a point about Australian society. The texts include a speech, a newspaper article, a summary of a book chapter and an online journal article. Ask students to read the whole text from which the extract comes. What other sources has the writer used? How significant is the play in the argument being made? How does the context of each extract affect the way the play is understood? How does the form of each extract affect the way the play is understood? ‘Conjuring an image of the generation gap at the outset of the 1960s, Alan Seymour’s The One Day of the Year (1960) marked a breach in the father-to-son reproduction of masculinity. The breach is physically enacted when Alf hits his son Hughie for showing disrespect to the ex-servicemen who march on Anzac Day: “That’s men like my father he’s talking about”, exclaims Alf to his wife in justifying his violence. Yet earlier in the play, Alf’s investment in his son’s social mobility beyond his own working class milieu is also physicalised when Alf kneels to clean Hughie’s shoes as Hughie studies statistics for a university degree in economics. Like the suburban men in Patrick White’s The Season At Sarsaparilla (1962), Alf is already employed in the service economy (he operates a lift in a city department store) and is thereby displaced from the productivity of industrial labour and life on the land. As they read the play: students can make note of social history by collecting notes on different social expectations explicit or implicit in the text. After reading the play: students should consider what insight the play has given them about the ways Australians lived and thought. They can construct a comparison chart of contemporary and mid 20th-century Australia, focusing on changing technology and consider how has technology changed the way we live. In the play, Hughie and Jan are reporting for the university newspaper on Anzac Day. They want to create an exposé of the real Anzac Day. For this task students will be reporters of the Anzac Day commemoration by writing a feature article or televising a current affairs report – depending on the time of the year, this can be from the event or it can be about the event. The article/TV report can be about the way different generations remember Anzac Day or students can choose their own angle. The article/TV report will need to include historical evidence, literary evidence and other elements, such as interviews and photos. For an understanding of how the media promotes Anzac Day, go to the 2013 ANZAC Day Media Style Guide published by Monash University and the University of South Australia; it gives directions to journalists on how to approach Anzac Day interviews and writing. Focus question: why is The One Day of the Year such a significant play? Every text reflects and reinforces particular values and attitudes in a society. When the attitudes are so strongly held that they are difficult to question, they take on the status of ‘myths’, stories passed down through generations who forget the origins and just blindingly accept the rhetoric, becoming a truth that refuses to be challenged. Anzac Day is one such truth that has reclaimed its place as an important national day, but at the time that Seymour wrote there was a growing disengagement with the way Anzac Day was celebrated. While not many literary articles have been written on the play, it is frequently commented on in historical articles because it captures an important moment of social history. The initial response was of strong opposition. The play was written in 1958 for the 1960 Adelaide Festival but never appeared there. Major General Hopkins, administrator of the first Adelaide Festival, felt it was an ‘attack on soldiers who had volunteered and fought for their country’ and pushed to ban the play; his views are extracted in this ABC interview with Seymour. Since then the play has had many revivals and has achieved historical credibility as a true reflection of the tensions around Anzac Day at the time. The play is now regarded as a historical artefact. Marilyn Lake’s article ‘We must fight free of Anzac lest we forget our other stories’ is a significant commentary which uses Seymour’s play as a historical reference. Trace the changing attitudes to Anzac Day. The year 2015 is the centenary of the landing at Gallipoli so there is an expectation that schools will be responding to this event. This task will require historical research and wide reading. Task: As part of the celebrations students can be asked to design a collage drama on Anzac Day with a scene from The One Day of the Year as the central element and historical research supporting the inclusion of other texts. They need to think of a theme that unifies the drama. The best presentations can be performed at a school assembly. The collage drama can include historical readings, letters from Anzacs, newspaper articles and whatever else they think is relevant. A collage drama needs to have cohesion which comes from following a theme and using a linking device between the different elements of the performance. What is the theme of the performance? Students need to think about what is important. What is the context? Remember this task is set around Anzac Day and it is a day of commemoration. Which scene in the play will be used? What are the important features of the scene that will be developed? What other texts will be used? How will these texts be linked (a symbol, a narrator, time, lighting, sound effects, etc.)? How will the texts be organised (in chronological order, by text type, by different voices, alternating times with flashbacks, etc.)? The reflection can centre on a question such as: how did the construction of the collage drama help you to understand the issues around the play and Anzac Day? The accompanying explanation can include the way the drama was constructed and a reflection on the process of developing the collage drama, as well as the development of the central issues. Students need to be reminded that this is not an explanation of the drama but of the thinking behind the drama. Students collect theatre programs, such as this program for Heidelberg Theatre Company, to see the layout and expectations. They consider what sub-headings they will use. They can then work on the different parts of the program, conducting research and collecting notes relevant to their collage drama. One student can do the layout and other students can be the editor and proofreader. Students need to choose a good online program for publishing. Bean, C.W. Commonwealth of Australia Gazette, No.39, 17 May 1915. Bollen, J., Kiernander, A. and Parr-Rodopi, B. ‘Men at Play: Masculinities in Australian Theatre since the 1950s‘, Amsterdam/New York, (chapter summary), 2008. Crotty, M. and Spittel, C. ‘The One Day of the Year and All That: Anzac between History and Memory’, Australian Journal of Politics and History, Vol. 58, No. 1, pp.123–31, 2012. Department of Veterans’ Affairs, Understanding Anzac Day, Past Present and Future, 2002. Department of Veterans’ Affairs and Ryebuck Media Pty Ltd, Gallipoli and Australian Identity 1915–2000, 2000. ‘Gallipoli’s shadows’, The Age, 25 April 2003. Gower, S. Sir Albert Coates Oration – Speech delivered by Steve Gower AO AO (Mil) ME, Director, Australian War Memorial at Ballarat University, 25 November 2008. Jinman, R. ‘Stirring struggle endures to this day’, Sydney Morning Herald, 2 April 2003. Lake, M. ‘We must fight free of Anzac lest we forget our other stories’, The Age, 2009. Lever, S. ‘Peter Yeldham’s Reunion Day: An Anzac Day Play on British Television’, JASAL, No.9, 2009. Monash University and the University of South Australia, ANZAC Day Media Style Guide, 2013. Parker, B. Culturazi review of Canberra Repertory Society performance, 2008. Sparrow, J. ‘Memory and the anti-politics of Anzac’, Overland, 24 April 2012. ‘The one day of the year keeps past glories alive‘, The Australian, 2012.